The Caltrain Downtown Extension is part of a package of improvements that was estimated to produce the greatest number of new daily riders in MTC's Blueprint. Over the past five years, the dramatic increase in traffic congestion on the Peninsula has brought into focus the need for a fast rail transit connection between the South Bay, the Peninsula, and downtown San Francisco. Caltrain's current terminus at Fourth and King Streets, more than a mile from the Financial District, forces most Caltrain riders to use connecting Muni service, which adds significant time to their daily commute. We propose to rebuild the Transbay Terminal at its present location at First and Mission Streets and provide a direct rail tunnel connection to it from the current depot at Fourth and King Streets. The facility is being designed for a future connection to the East Bay and Capital Corridor service. The project will significantly expand ridership by providing direct downtown service, eliminating the disincentives introduced by the need to transfer to local surface transit and the associated travel time penalties. For thousands of commuters traveling between downtown San Francisco and locations in the Peninsula and South Bay, the extension will turn Caltrain into a realistic option, effectively competitive with the automobile. The Transbay Terminal is already the most active multimodal center in the region; served by 64 bus routes operated by AC Transit, MUNI, Golden Gate Transit and SamTrans, as well as by Amtrak and Greyhound intercity buses. The new Transbay Terminal, with its pedestrian-oriented design and direct bus-rail interface, will vastly improve the commute and enhance trip connectivity for transit users from seven Bay Area counties. The Caltrain extension also ensures that the region will have a strategically located high-speed rail terminal in downtown San Francisco. The Caltrain Downtown Extension will run from the existing train terminus at Fourth and King Streets to a rebuilt Transbay Terminal at First and Mission Streets (see Attachment 1 for map). 1Source: Goldman, Sachs & Co. report dated May 9, 2001. Figures are in 2001 dollars. 2Source: Caltrain Downtown Extension Draft EIR/EIS. Kaiser Engineers, 1997. Figures are in 2001 dollars. NOTE for REVIEWERS: The costs shown in the JPB application include vehicles worth $48 million, which should not be charged to the project. Also, they show Design, CM and Contingency at $241 million, which is 67% of the actual construction cost of $377 million. This is extraordinarly high. 3The project costs and financial plan are being revised as part of the Caltrain Downtown Extension/Transbay Terminal EIR/EIS currently underway. Three alternatives are under consideration. The Caltrain Downtown Extension is one of the two unfulfilled regional rail expansion commitments remaining from the original list of Tier 1 projects included in MTC Resolution No. 1876. According to the RTEP criteria, rail investment in those corridors will receive priority consideration in the next agreement. Under TEA-21, Section 1601, the Transbay Terminal project received an earmark of $9.375 million. Part of these funds was approved by MTC in June 2001, for preliminary engineering design work. We will be seeking additional new rail starts funds through the TEA-21 reauthorization process. This project did not receive funding from the Traffic Congestion Relief Program, but it received a $20 million earmark in the 2002 state budget. The project is eligible for ITIP and STIP funding. In addition, AB 1419, which is well on its way to passage by the Legislature in the current session, mandates the transfer of land parcels in San Francisco, valued at over $320 million and currently under State control, to the Transbay Joint Powers Authority and to the San Francisco Redevelopment Agency. The bill dedicates revenues from land sales to defraying the costs of constructing the downtown extension and terminal. In addition to the proceeds from the sale of the land, valued at a minimum of $385 million, pursuant to AB 1419, the project will receive at least $827 million in tax increment financing revenues, and an estimated $372 million from the net operating surplus of the terminal building (mainly from commercial lease income) for a total of $1.7 billion in local contributions. This amounts to a maximum potential local contribution of nearly 89% of the total project cost of $1.88 billion. A dedicated revenue stream of such magnitude, unique in the United States for a transit project of this kind, is only possible in a dense urban setting like San Francisco, characterized by intensity of its land uses, the concentration of economic activity, and the resulting high desirability and value of the real estate adjacent to the proposed terminal. In addition, the project includes a considerable operating revenue stream, which is discussed below, in Section e. The project enjoys solid local support in San Francisco as evidenced by the passage in 1999, by a 69.1% margin, of Proposition H, which makes the construction of the Caltrain Downtown Extension and Transbay Terminal the official policy of the City and County of San Francisco. Although AB1419 would dedicate the revenues from land sales and tax increment financing to the project, clearly obviating any questions about local commitment and/or local match for federal funds, the truly regional nature of the project calls for an appropriate regional share of the cost. San Francisco will actively advocate for such a contribution, while maintaining an above average local commitment level. 1Per Goldman, Sachs & Co. report dated May 9 , 2001. Includes $3 million in annual bridge toll operating support per MTC Resolution 3300. 2We will seek to reduce this amount by appropriate contributions from other Bay Area counties directly benefiting from the use of the project and/or by an increase in New Starts funding. There are two components to the project: the tunnel extension of the Caltrain mainline, and the rebuild of the terminal proper. The anticipated ongoing operating and maintenance costs are discussed separately for each component. The operating cost of the extension is driven mainly by labor and equipment costs. Moving the terminal from Fourth and King to the Transbay Terminal, a distance of only 1.2 miles, adds only a very small fraction to the system-wide costs of operating the line over its 77-mile reach between San Francisco and Gilroy. That cost, assuming 120 daily trains, is roughly $14 million per year4. No additional rolling-stock will be required in order to operate the extension. The new terminal building will feature numerous sustainable design features including an open design to optimize natural ventilation by harnessing prevailing winds and maximize natural light, which will reduce costs for lighting, and a system to collect rainwater for maintenance and irrigation. Operating costs for the new facility are estimated to range from $6.7 million in year 1 to $15.8 million in year 30 in 2001 dollars. The expected $14 million/year increase in train operating costs due to the additional mile of service into the Transbay Terminal will be more than offset by fare revenues from increased ridership resulting directly from the extension5. Long-term ongoing operating revenues are anticipated mainly from commercial lease income. In addition, MTC Resolution 3300, approved in June 2001, establishes a commitment to continue the existing $3 million in annual bridge toll operating support. The building is expected to have positive cash flow on the order of $10 to $13 million per year, which will help finance the construction costs. The project will not result in diversion of any operating funding from existing bus service. 4Assuming $1800/train-hour (per Caltrain Downtown Extension DEIS/DEIR), 10 additional minutes between 4th and King and TBT cost $300 per train. For 120 trains/weekday and 60 trains/weekend day, it amounts to about $14 million per year. 5Per JPB's estimates and MTC's Blueprint Evaluation Report, calculation assumes 40,000 new riders in 2020 from a package of improvements including grade separation, electrification and the downtown extension. 4,000 of those trips are directly attributable to the downtown extension. A $0.75 surcharge is applied to downtown extension trips, per the JPB's RTEP proposal. An average fare of $4.75 (including the $.75 surcharge) is assumed for the remaining 4,000 trips. Total weekend ridership was assumed to be half of average daily ridership. The Caltrain Downtown extension to the rebuilt Transbay Terminal will connect the South Bay with the region's largest and densest concentration of employment, San Francisco's Financial District. Unlike many other rail extension projects around the country, the project's location in an area that is intensely urban and already densely populated obviates the need to speculate about future land use changes in order to justify its viability. The proposed extension is consistent with the findings of MTC's Blueprint evaluation, which found that rail extensions capture significantly more ridership in the densely settled urban core of the region. Even though the Financial District is substantially built out, there are opportunities for additional development that will further contribute to increased Caltrain and bus ridership growth, improving the project's cost effectiveness even more. The current transit-oriented development plan for the Terminal and surrounding land parcels vacated by the State includes 5.6 million square feet of new residential space (approximately 4,000 new housing units), up to 1.2 million square feet office, 355,000 square feet of retail, and 473,000 square feet of hotel space (in one 1,000 room hotel)6. Not only will the transit-oriented development at the Terminal will provide needed funding (through tax-increment financing), it will also increase the density of employment and residential units at the new multi-modal transit center. This will improve transit access from throughout the region to new jobs and from the residents of the new units to the region. In addition, an unprecedented amount of development is projected in the southeastern part of San Francisco in the next 20 years. The Caltrain extension and rebuilt Transbay Terminal will provide another, excellent transportation option to new residents and workers in that area. San Francisco's General Plan and Planning Code have for several decades included policies and requirements (e.g. Transit First, Transit Impact Development Fee applied to the downtown, parking restrictions and disincentives, etc.) to ensure transit-oriented, pedestrian-scale and mixed-use development. These existing policies will contribute to ensure the success of the Caltrain extension to the Transbay Terminal. Based on the expected construction and operating costs, the annualized cost per new rider is estimated at $11.02.7 This is very good compared to other potential rail projects in the region. Indeed, MTC's own analysis for the Bay Area Blueprint for the 21st Century confirmed that the Caltrain extension is part of a package of improvements that will generate more new riders than any of the other 76 Bay Area transit projects studied. Greater frequency and speed would generate most of the increase. The rebuilt Transbay Terminal will increase to 50 the number of bus bays for AC Transit. This will support a planned increase of 75% in Transbay bus service. Given the level of vehicular congestion on the Bay Bridge corridor, and with BART service at or near capacity in the Transbay tube and Market Street portions of the system, more frequent AC Transit service into the Transbay Terminal offers the most cost effective means of increasing transit capacity in that corridor. 7Assuming an annualized construction cost of $62.8 million and a marginal annualized operating cost of $0 (see section e), for a combined annualized cost of $62.8 million, and using MTC Blueprint Evaluation Report estimate of an additional 4,000 new Caltrain riders per day and SMWM's (final source pending) estimate of 15,000 new bus riders per day at the terminal, the cost per new rider is $11.02. Caltrain presently terminates more than a mile away from the major employment concentrations of the Financial District, far from the BART and Muni Metro stations on Market Street, and from the Transbay Terminal. By extending the Caltrain terminus to the Transbay Terminal, the project will act as a critical gap closure, improving inter-county travel via Caltrain, BART, Muni Metro, Golden Gate Transit, and AC Transit. Indeed, these connections will provide direct access to seven Bay Area counties from one terminal. In addition, the extension is being designed to accommodate a future connection to the East Bay and Capital Corridor service. The project has great potential for improving interregional travel by connecting to Greyhound, the Amtrak bus bridge to the East Bay, and a future high-speed rail system. 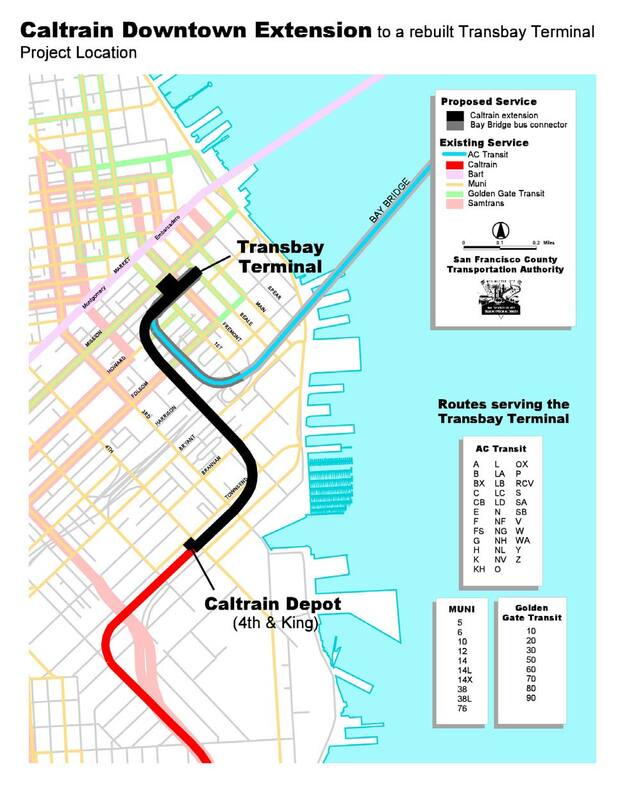 The level of transit service connectivity achieved at the Transbay Terminal by extending Caltrain to it will be unparalleled anywhere west of the Mississippi. In the last five years, Caltrain service has doubled, 40 to the present 80 trains per day. TCRP funding has been earmarked to help implement express service (baby bullets). Improvements recommended in the Rapid Rail Plan, including the construction of passing tracks, are being implemented at a rapid pace. According to the Joint Powers Board, they will be running 120 trains to the Fourth and King depot by 2003. Furthermore, the electrification of the Caltrain will further increase its flexibility and service improvement options. Eleven Muni bus lines serve the Transbay Terminal, providing local transit service to all areas of San Francisco. The Muni Metro subway and bus and streetcar lines on Market Street are one city block away. Most Muni routes serve the Financial District and are accessible to passengers at the Terminal. Presently, thirty-five transbay bus routes terminate at the Transbay Terminal providing access to the urban core of the East Bay, from El Sobrante to the north to Fremont to the south. The rebuilt Transbay Terminal Improvement Plan includes a bus transit use growth forecast to 2020 of 75%, from 20,000 to 35,000 passengers. Ten SamTrans bus lines terminate at the Transbay Terminal. They provide express bus access to the San Francisco International Airport and several cities in San Mateo and Santa Clara Counties. Eight Golden Gate Transit lines currently stop at the Transbay Terminal, providing transit service between Marin, Sonoma, and San Francisco Counties. BART station entrances are located at Market and Second and Market and Fremont, within a short walking distance of the Transbay Terminal. BART provides key connections between Alameda, Contra Costa, San Mateo, and San Francisco Counties. Several other operators, such as Greyhound and Amtrak, provide interurban connections to rest of California and the US. The Caltrain Downtown Extension will offer exceptional multimodal system access, more than any other rail extension project in the region. Furthermore, this high level of system access is already in place; it is not speculative nor does it depend on additional actions by outside agencies not associated with the proposed project. The terminus will be located in San Francisco's Financial District, which has the highest volume of pedestrian traffic in the region, supported by high density, mixed land uses and a pedestrian- friendly urban environment featuring wide sidewalks, abundant ground floor retail, narrow streets, and the like. San Francisco also has the highest volume of bicycle traffic in the region. Official bicycle routes (shared roadway) adjacent to the terminal include Second and Howard Streets. Nearby Market Street is an integral component of the city's bicycle network. Folsom Street, one block south of the terminal, has a bike lane. An attended bike station will operate at the existing Fourth and King Caltrain station. Caltrain's handling of bicycles onboard is widely considered one of the best in the US. Caltrain now accommodates more than 2,000 bikes per day, a number that is growing rapidly. By terminating at the Transbay Terminal, the Caltrain extension will support seamless transfers between various local, intercity, and interregional bus and rail transit, including AC Transit, Golden Gate Transit, MUNI, Greyhound, Amtrak, and future high-speed rail. The extension is also designed to be extended to the East Bay and Capital Corridor service. The reconstruction of the Transbay Terminal will provide a pedestrian access to BART and MUNI Metro on Market Street. It is also important to note that this project will cut in half the travel time from Visitation Valley and Bayview, neighborhoods with the highest concentration of low-income population in San Francisco. In addition, the terminal's connections to low-income and transit-dependent enclaves in the South (Caltrain and Samtrans) and East Bay (AC Transit) will help to improve mobility for many low-income populations throughout the Region. The joint Caltrain Downtown Extension/Transbay Terminal EIR/EIS currently underway, is scheduled for completion in fall of 2002. The detailed EIR completion schedule is shown in Attachment 2. The project has received federal funding for engineering design.